In addition to the many private and corporate collections that boast her work, she has watercolors in the permanent collections of the Portsmouth Museum in Portsmouth, Virginia, and the Caswell Council for Arts and History in North Carolina. 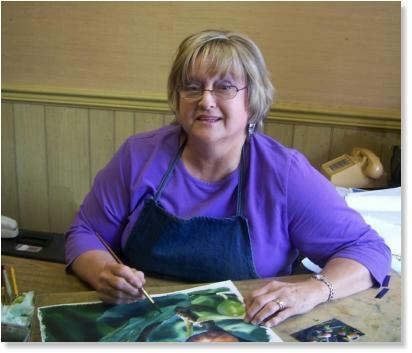 Karen Shelton currently shows her work at her home studio in South Boston, Virginia. God gave me a gift that I have enjoyed all my life; and now, feeling more grateful and taking it more seriously, I am working hard to cultivate and improve on that desire. I admire artists who bring the hurts of the world to our attention; but I personally need to express my love and appreciation for the beauty of life. I am presently painting still lifes  objects and flowers that, for me and hopefully my audience, evoke warm feelings of family, serenity and even spirituality. I have stopped doing the 'outdoor festivals' but will continue selling from my studio/gallery and my website. 2009 4 Bridges Art Show, Chattanooga, Tenn.
Artspring 2009, Decatur House, Washington, D.C.
Allan Ingles Palmer Memorial ... Best Watercolor, Roanoke, Va.
Best in Show, watercolor, Artspring, Washington, D.C.
Fourth Place, Whalehead Art Show, Corrola, N.C.
Second Place, Seawall Art Show, Portsmouth, Va.
Award Of Distinction, Virginia Watercolor Society 29th Annual Show, "Blue Moon Rising/Nevermore"
Third Place, 29th Annual Juried Show, Caswell Council For the Arts, "Silent Sentinel"
First Place, Watercolor, Bon Air Art Affair, "Roses and Ponegranates"
Published: invited to be included in "How Did You Paint That? 100 Ways to Paint Flowers & Gardens"
". . . I am a firm believer that artists can and should bring beauty and fresh vision to our lives. The Best-In-Show, Karen Shelton, "Reflections of Serenity and Joy", was noteworthy for its seamless merger of technical virtuosity, symbolism, and surprising beauty . . ."
" . . . great composition and mastery of watercolor . . ."
"Lois' Clematis/Rainbow" by Karen Shelton is one of the most interesting pieces in the show in regard to a sense of depth. It is hard to tell where collage ends and painting elements begin. The engagement with the materials is what makes this image work." " . . . Shelton is a master when working with watercolor. In her work you see boldness, life, exhilaration." " . . . Particularly effective use of watercolor medium. For all the attention to the optical realism, there was an unmannered treatment of the watercolor. Sense of immediacy in the handling. Effective broad washes as well as the small more articulated marks. Very effective image." " . . . pushed further than realism . . . well composed work . . . has impact . . . most compelling . . ."